Known for its mysticism and for having the first star rated resort in Bali, Sanur is still considered today as one of the areas in Bali where you can feel the true spirit of Bali. Quiet and relatively laid back Sanur has a certain flair about it that appeals to just about everyone. It has a great stretch of white sand beach, with a variety of water sport activities for all ages to enjoy, fine hotels, villas, restaurants, traditional drama places as well as modern entertainment establishments. It is also one of the preferred areas in Bali, where affluent residents prefer to setup residence. Being almost in the center of Bali's major tourist areas, Sanur is a good location to explore Bali. The rates shown here are available only for bookings made via this web site, and are not available from the hotel directly.The rates shown here are approximate. To see a confirmed rate for your booking request please e-mail us make your best Room rate. Vision Bali has also negotiated via a third party to list many other popular hotels and this is presented as a listing with an idea of pricing. All these enquiries and bookings will be handled by our online travel partners. 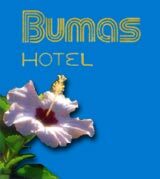 Bumas Hotel Sanur Bali offers 75 guest rooms set in the tranquility of a secluded, lush, tropical garden. Air conditioned interiors feature harmonious Balinese and classical Javanese design, emphasizing comfort and space. Dining is outdoors in a thatched roof pavilion. Check out their website for facilities, services and rates Clik here!! Radisson Bali Hotel is an international 4-star resort hotel dedicated to good value and genuine hospitality. Situated between Sanur village and its white sand beach, Radisson Bali offers its guests an experience of traditional Bali with the comfort and facilities of a modern resort. Its 329 rooms, restaurants, lounges, and bars are arranged in a low rise complex of terracotta roofed buildings surrounding a landscaped swimming pool winding tree lined paths and lush tropical gardens. 16 Deluxe Villa cottages, of recent construction, set in a hidden and peaceful garden area. Featuring the latest facilities and equipment in a Balinese architecture inspired design. The use of natural elements and colors, ie. good teak, marbles, terrazos, lime stone and other local materials has been maximized . Only at the Puri Santrian on Bali will you find the magic you've been looking for in a hotel. Bali, known as "The Island of the Gods", is the setting for the Puri Santrian set amongst 3.5 hectares of beautifully sculpted tropical gardens. Sanur Beach with its natural beauty of golden sand and tropical breezes creates for you a harmony of culture and tradition that you will experience no where else in the world. Witness the elaborate and colorful ceremonies and the unique Balinese rituals which are a part of the daily life here. The Puri Santrian offers you all this, along with the comfort and style you deserve and can expect. Facilities for guests' recreation and relaxation include a Balinese village-style Spa, swimming pool, tennis, badminton, volleyball, pitch and putt golf, snorkelling, scuba diving, deep-sea fishing, windsurfing, waterskiing. billiards and giant chess. Camp Sanur, a children's activity centre, is ideal for children who want to spend fun-filled hours in programmes designed specially for them. There is also a fully serviced Resort Centre to assist guests with vacation and tour arrangements as well as Bali Hyatt's resort-wear boutique, a beauty salon and a drugstore. Natour Sindhu Beach is located at Sindhu Beach, Sanur - Bali : one of the most famous beach destinations for tourists in Bali. Conveniently located on the East coast of the island, it provides instant access to discover the countless remarkable tourist attractions. Segara Village, located on the lush, tropical beach of Sanur, beckons visitors with the tradition and setting of kings of an ancient time. The rich culture and tranquility of Balinese life is echoed throughout Segara Village, which as the name suggest, is designed and built round the concept of Balinese village a theme that is repeated throughout the distinct compounds within the segara complex. Located only 15 minutes from Nurah Rai International airport at the femous resort of Sanur Beach.